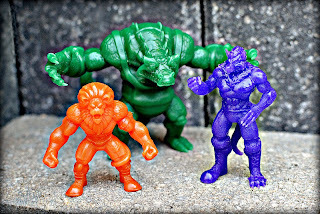 When I went to C2E2 back in April, one of the coolest toys I picked up there was the debut set from an indie line called Mystical Warriors of the Ring, a universe of animal wrestlers created by Fantastic Plastic Toys and produced in collaboration with Marty "The Godbeast" Hansen and various other artists. 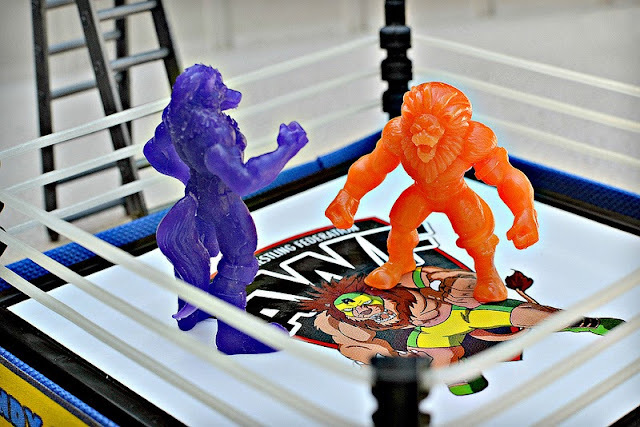 In my initial post on the line I covered the debut set in detail, including the first two figures--Goliath and Ulric Wolfrom--as well as its wrestling ring and packaging. 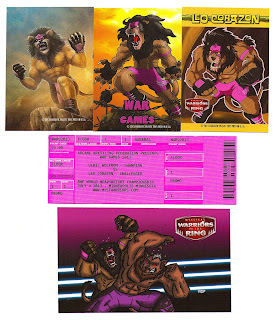 Since then, Fantastic Plastic Toys has unleashed the line's second release--the lion wrestler Leo Corazon. The release was titled "War Games," centered around the story of Leo going up against Ulric in the ring. As with the first two figures, Leo was released in a few different color options: Metallic orange, Aztec gold and thermal color change orange/yellow. Once again, I got the color change material. As I mentioned before, there's something about it that gives the figures a slightly translucent appearance which makes them look extra cool. When placed in warm water, Leo changes from a deep orange to a bright lemon yellow. Both colors are very appealing and apropos for the lion-nature of the character. I really love how for a short time when the colors are transitioning, you can make Leo a mixture of both orange and yellow. The colors really make the figure pop. As for the sculpt itself, Leo is very nicely detailed for his small 1.5" size (Goliath the crocodile is still the massive giant when it comes to MWOTR) and comes in a basic-but-battle-ready stance that makes him look like he's standing in the ring roaring, about to pounce at any second. One of my favorite little details on the design is how his tail wraps around his left leg. 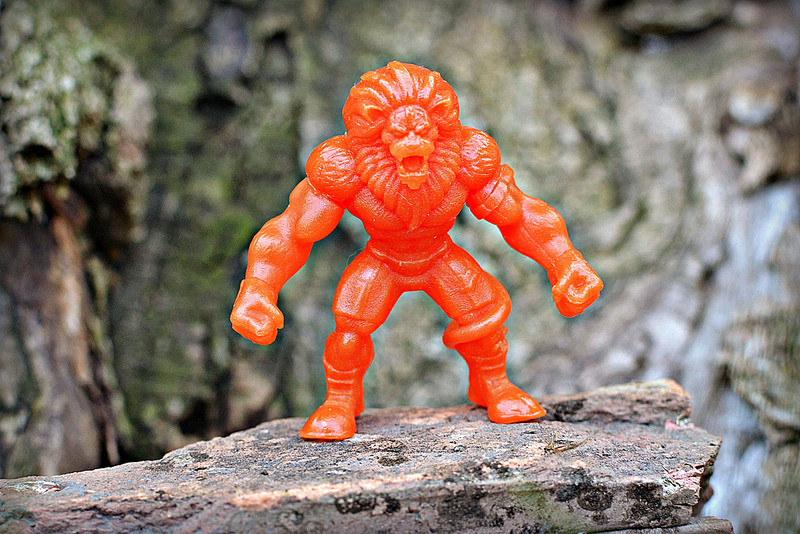 As far as material, Leo is done in the same urethane material as the past figures, which gives him the feel of a light, hard plastic. 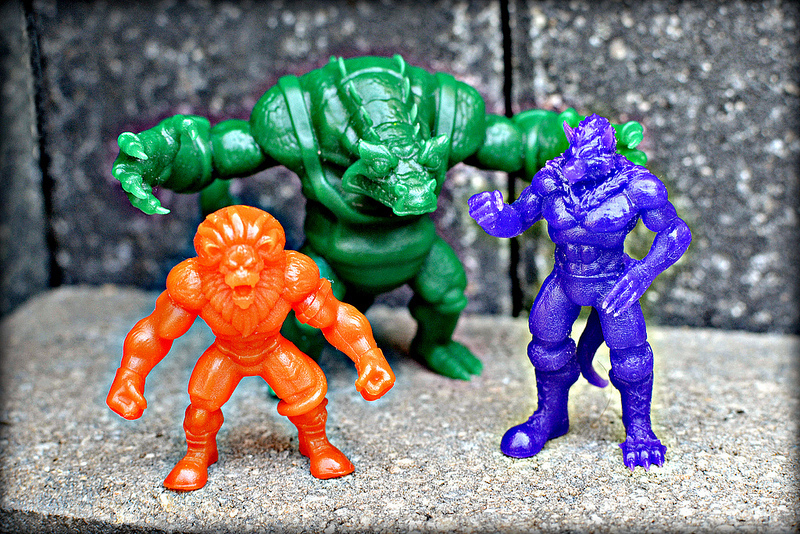 It should also be noted that The Godbeast does an excellent job with the casting of these figures--they come out looking incredibly clean; in terms of casting I can't really find any flaws on my Leo figure, which isn't something that can be said about the majority of indie toys. There was once again a lot of work put into the presentation of this MWOTR release. Leo came packaged individually on a firm cardboard backing featuring cool artwork of him on the back, with the figure placed in a plastic bubble that can be reattached. 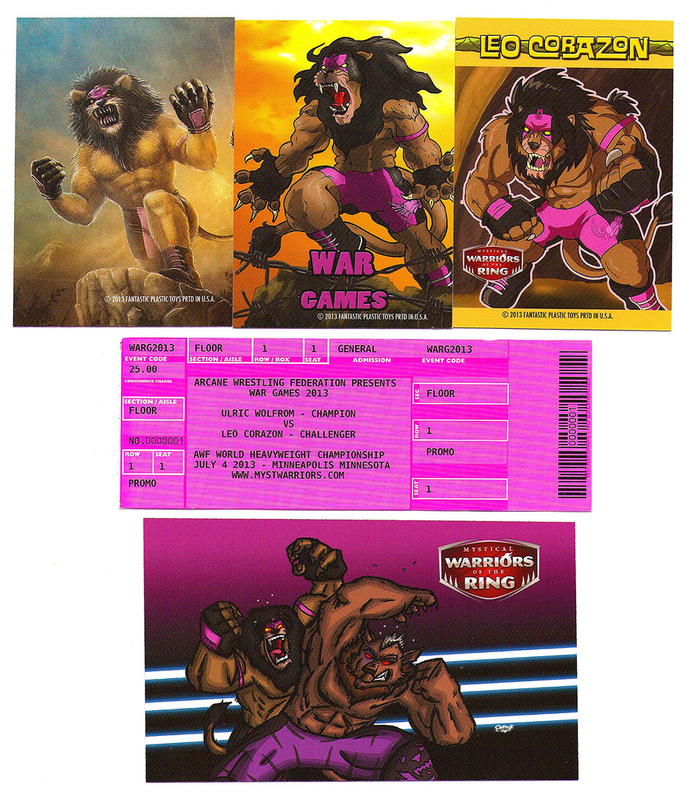 Also included are a a few different trading cards featuring art by Nathan Newell and Levi Hoffmeier, a larger card with the backstory of the Leo vs. Ulric match, and a realistic event ticket for the match. All of these added elements really help make the MWOTR releases extra special. Leo quickly sold out when he went up for sale earlier this month, but a post on the MWOTR website indicated that a re-release could potentially happen, so be sure to follow the site for any updates and that and other news with the line. I have to say, probably what I love most about Mystical Warriors of the Ring is that it's founded upon such big ideas. The creators aren't just making figures, they're making a multifaceted little toy world consisting of involved character stories, a range of corresponding artwork, accessories, carefully-crafted and detailed packaging, animation and more. You have to admire the passion that's obviously going into this line. I am definitely a fan, and am looking forward to the next release, Johnny "Treegarr" Stumpz, which comes out in August.